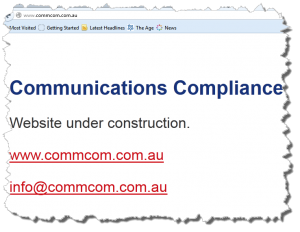 Communications Compliance Limited is a newly created regulatory body, responsible for systematically monitoring that telcos are complying with the 2012 Telecommunications Consumer Protections Code. TCPCode.com.au asks, and answers, 13 questions about the new authority that will figure prominently in the telco industry from 2013. 1. How does the TCP Code describe Comms Compliance? the independent body which monitors and reports on Code compliance, the role and obligations of which are set out in Chapter 9 and Appendix 1 to this Code. 2. What’s its legal structure? 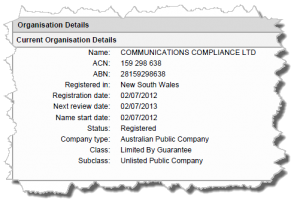 Legally, Comms Compliance is an Australian public company, limited by guarantee, under the Corporations Act 2001: Communications Compliance Limited ACN 159 298 638. That’s a commonly used structure for not-for-profit organisations. 3. Who owns Comms Compliance? So CC isn’t owned or operated by government. It’s a private sector body with a public agenda, somewhat like the TIO. 4. So is it legally the same as TIO? allows ACMA to exempt a telco from joining the scheme where appropriate (eg if there is a very low risk of TIO issues for that telco). None of those factors apply in the case of Communications Compliance. In that sense, it’s on less stable, or fertile, legal ground than TIO. Its role and authority seem to depend a lot more on ACMA recognising it than on direct Parliamentary authority. No doubt, that reflects the self-regulatory nature of the entire TCP Code process. The Code is first a legal initiative of industry, not of government. 5. Where is CC headquartered? It’s currently subletting space at Level 9, 32 Walker Street, North Sydney NSW 2060, the offices of Communications Alliance. We don’t yet know if CC will work out of separate facilities. 6. Who are the key people in Comms Compliance? It’s early days, and we only know four names: Deirdre Mason, Michael Lee, Victoria Rubensohn and Christiane Gillespie-Jones. They are all directors of the company. Deirdre was a City Councillor in Victoria from 1980 to 1983 and has held executive positions in Telstra and directorships with the Melbourne International Comedy Festival, the Australian Children’s Television Foundation and the National Heart Foundation. She is currently the President of the St John Ambulance Foundation. Mr Lee is currently the chair of Communications Alliance and served as Federal Minister for Communications from 1993 to 1996, in the lead up to the 1997 deregulation of telecommunications that created today’s competitive and often chaotic comms marketplace. He’s a non-executive director of CC. 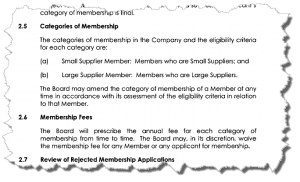 Under CC’s constitution, the chair of Comms Alliance, or their nominee, has a guaranteed seat on the CC board as an ‘industry director’. Ms Rubensohn has a strong background in communications regulatory policy and serves as ‘consumer director’ at CC. She also has notable human rights credentials, and a legal background that will be important for CC’s development as a monitor/regulator. Ms Gillespie-Jones was most recently Manager of Policy and Regulation for Communications Alliance, and she managed the revision of the Telecommunications Consumer Protection Code for CA. Christiane was appointed as CC’s Executive Director in September 2012. 7. Is Comms Compliance a national body? It certainly is. The TCP Code applies nationally, and CC’s role and responsibilities are national. 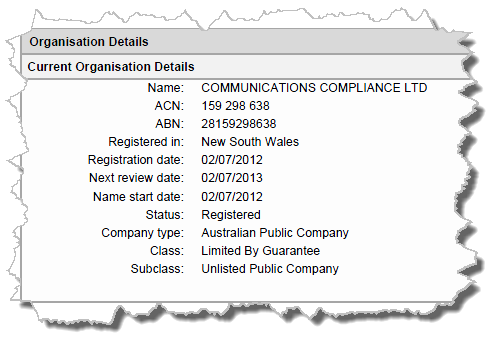 Queenslanders, Sandgropers, Victorians, Tasmanians, Canberrans, Crow Eaters and both kinds of Territorian might gently point out that Communications Compliance’s entire board and only member are Sydney residents (according to the company’s records) but that just reflects early days. The company’s constitution allows up to seven directors and over time, we’re sure there’ll be a more diverse geographical membership. From little things big things grow. 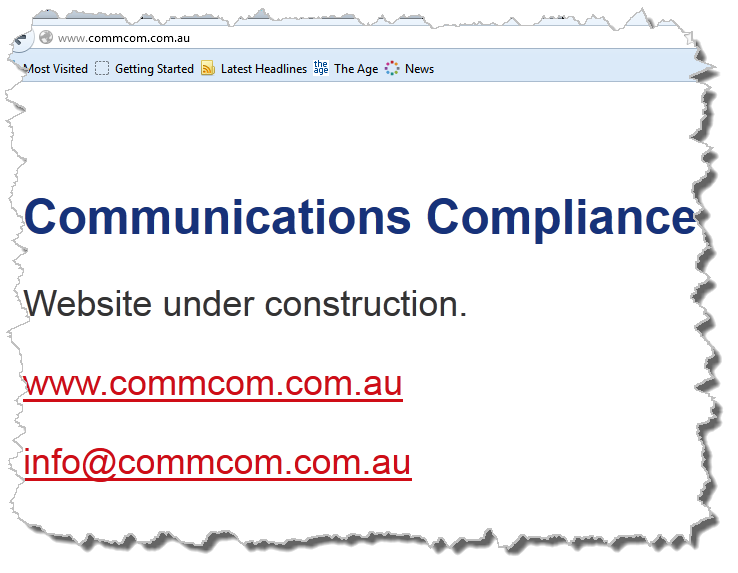 CC’s website at www.commcom.com.au is still under construction as we write. Given that the Code has only been registered since 1 September 2012, it’s not surprising that a fully developed website has yet to be unveiled. We predict plenty of action soon enough, with content that will be compulsory reading for Australian telcos. 9. How is Communications Compliance funded? That is one of the TCP Code’s great unanswered questions. Unlike the Telecommunications Industry Ombudsman Scheme, which can compel telcos to become members under an Act of Federal Parliament, there’s no statutory basis for any compulsory membership of Communications Compliance. And unlike Communications Alliance, which is an industry association and can properly accept assistance from the industry in cash and kind, Comms Compliance must act, and be seen to act, independently. Perhaps a number of major telcos have some spare office space they could make available to CC, but CC couldn’t accept any such offers. We expect that CC will get started on the basis of some ‘seed’ capital that’s arranged on as close as possible to arm’s length terms. After that, it will seek to fund its operations at least partially from lodgement fees for documents and certifications mandated by the TCP Code — described in its Constitution as a ‘fee for service’ approach. Ultimately, the funding of CC is a legal and practical challenge that its board will no doubt be giving considerable thought. One key strategy appears to be membership fees. 10. Did you say ‘membership fees’? Yes, we did. Communications Compliance’s Constitution provides for additional members, in ‘large’ and ‘small’ categories that correspond to the ‘Large Supplier’ and ‘Small Supplier’ definitions in the TCP Code. 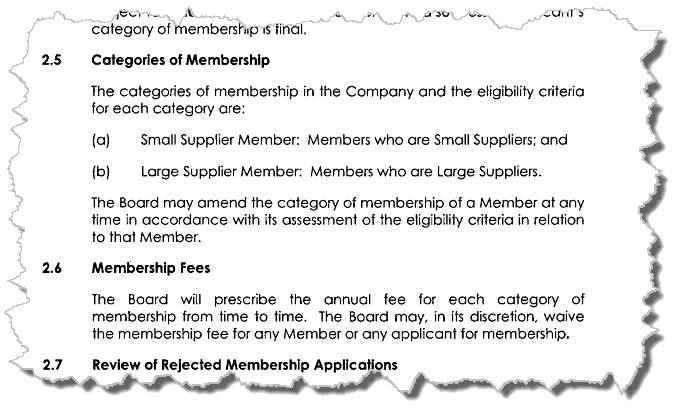 Each category would have an applicable membership fee, to be applied to CC’s operating costs. 11. What enforcement powers will CC have? The strict legal answer is ‘none’. It has no power to penalise or punish anybody for anything. But the industry has to understand that in a very real way, CC stands between telcos and the Australian Communications and Media Authority. While ACMA (and ACCC for that matter) don’t need CC’s permission to take strong and direct action against defaulting service providers, we expect that ‘ordinary’ cases of TCP Code non-compliance won’t escalate to those authorities as long as Comms Compliance is willing to keep working with the telco, and not to report them as delinquent. Let’s just say that while CC has no enforcement powers, it has friends who have plenty. 12. What is Comms Compliance’s greatest challenge (so far)? It’s the same as for the whole industry: Getting up to speed with its role and responsibilities under the 2012 TCP Code, in very short time. With just 7 months from Code registration to first ‘Compliance Attestation’, CC must not only be ready to carry out its important role, it has to do it without any real road map. This is genuine trailblazing. 13. When will Comms Compliance ‘go public’? Well, it has already made its presence felt to some extent, alerting a number of telcos to potential compliance deficiencies at the time the unit pricing rules kicked in. But there’s a lot of behind-the-scenes work that Comms Compliance needs to complete before it opens for ‘business’. We expect to see the website launch in the next four to eight weeks, and plenty of important material to be online when that happens. 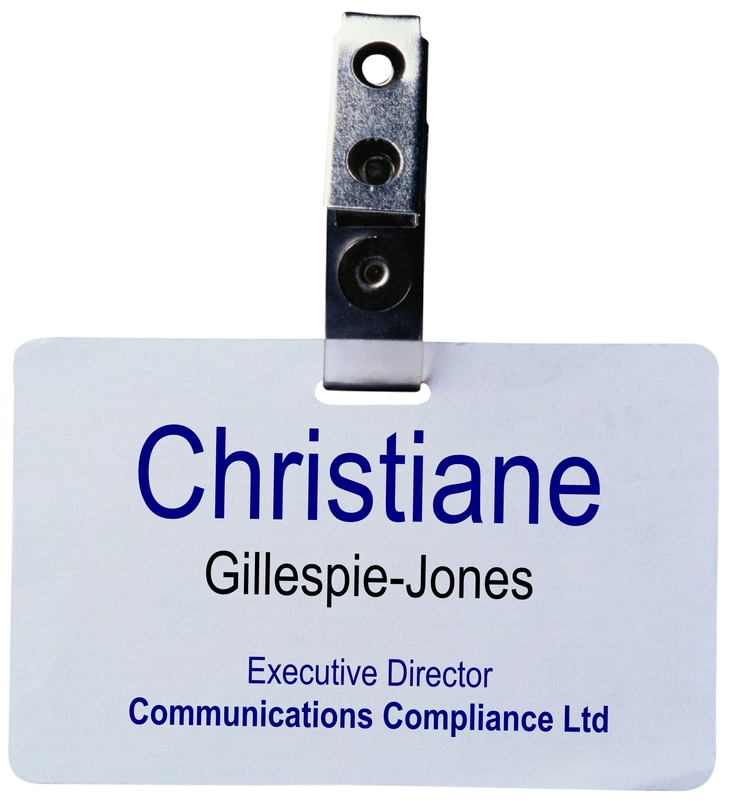 This entry was posted in Backgrounders, Communications Compliance Ltd, Compliance Attestation and tagged communications compliance, Compliance Attestation. Bookmark the permalink.